Friday, May 15th, 2015 | 8:16 pm	and filed in Synthesizers, Gear, peff. 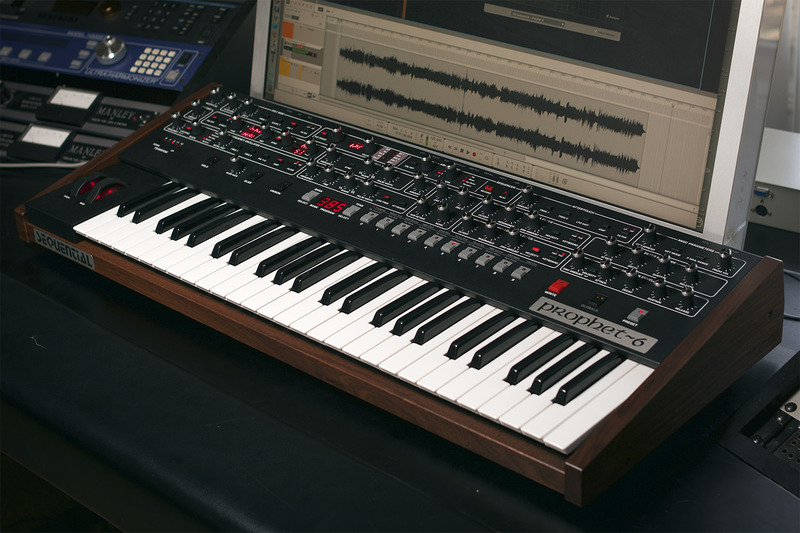 Unlike the previous sound design projects for the Prophet 12 and Pro 2 which are based on digital oscillators, the Prophet 6 has an analog voice architecture with digital control over the various parameters. Like it’s original namesake, the Prophet 6 has two oscillators with saw, triangle, and pulse waveforms, noise source, as well as the remake of the classic curtis low pass filter. The P6 includes some variations of the old poly-mod of the Prophet 5 which allows for some FM and wave shape modulations. Having spent so much time in the world of modular synthesizers where routing possibilities are unhindered, sound design on the fixed architecture of the Prophet 6 has been an interesting test of mod routings. At the same time, this is a keyboard instrument, and voicing patches should also respect the format for people who are great players. I’ve found myself first reverting to the sound of a classic six voice Roland Juno or the Prophet 5 as a base of inspiration, and then working with sequences to build up a voice that complements the envelope timings. Afterwards, I would apply the onboard effects to round off the patch. Actually Dave Smith’s philosophy is that a patch should sound good without effects so that the instrument could be tracked without fx cluttering a mix. « Buchla 208 Music Easel - Slider Cleaning!